What better way to showcase your products and services than with a brochure? If done well, this piece of literature could be something your clients will use time and time again, ensuring you remain in the forefront of their mind. You know a brochure has been a success when your prospect has contacted you because of it. But what size should it be? Materials, colours, how many you need, what it should look like, postal charges – all this could be quite challenging. Quite often, you will ask a printer for a specification, and they’ll just give you a quote. That’s fine if you’re in the industry and you know what you want and you have experience of what’s worked and what hasn’t worked. But for an end-user you may need a helping hand. That’s when someone like me will really help. 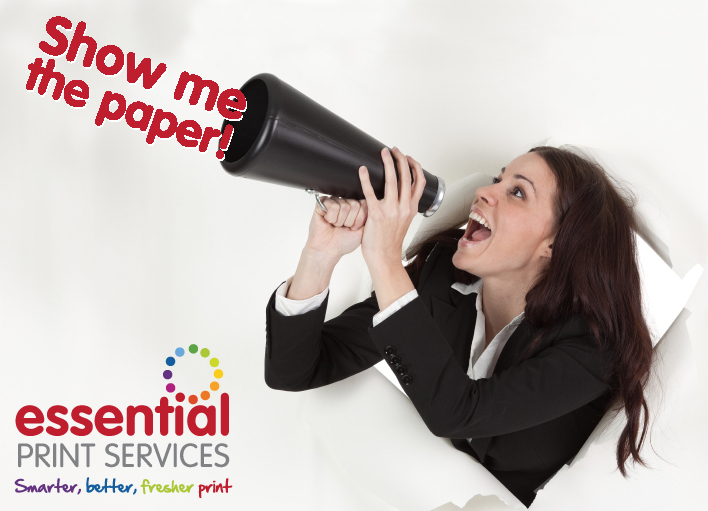 Hi, I’m Yvonne, owner of Essential Print Services, based on Pride Park in Derby and I’m going to cover just 5 of many things to consider when thinking about a brochure. Yes, people quite often email quote requests and I will quote on what they’ve asked for, but if there’s a more cost effective way to achieve the same result, then I’ll offer it as an alternative price or I would make a note on the quote offering my advice. I’ll help you get the results and get the most for your budget. I can talk you through your options, show you samples, and even have a brainstorming session and of course, present you with the most competitive prices. Someone like me will talk you through the print process step-by-step and let you know what stage the order is at. A human you can contact with queries at any time and who will be flexible and work with you and for you. If you’re going to invest time and money in producing a brochure, don’t include information that may give it a short shelf life. The last thing people want is to have to regularly change and update their literature. Include details that are less likely to change like website address, telephone number etc. Let imagery and graphics do all the talking and keep text to a minimum. I find that customers like to browse and look at pretty pictures than read endless amounts of text. If you are showcasing products, you may need to include specifications but keep this to a minimum. You will extend the brochures shelf like. And with a good call to action; “email us for a full spec sheet,” you will then have an excuse to call your prospect and find out exactly what they need. Thus the brochure’s job is complete – encouraging the client to get in touch. Include short testimonials – this will instil confidence. By including a picture of the person, this will prove that you haven’t simply made it up. But always obtain their approval before going to print. When it comes to the design of the brochure, you may want to have a go at doing it yourself but why spend hours on trying to do something you don’t have experience at? You would never attempt to fix your car if you’ve never lifted the bonnet. Your time would be best spent doing what you do best…running our own business. Finding a good graphic designer is crucial. Someone who knows what will work well design-wise, as well as what will reproduce well in print. That’s when designers and I work well together. We exchange ideas and ensure that the end result will achieve results for the client. They create artwork that is conceptually stunning and I ensure that the print will be just that, stunning. When using text, use typography. Typography is the arrangement of text in interesting ways, sizes and fonts. Any designer worth their weight in onions will know this already. My printing will only look it’s best when the artwork is good. Supplying low quality pictures and artwork will result in an inferior product. That’s the benefit of working with a print provider like me. At Essential Print Services, I personally carry out a 12-point artwork check and if I’m unsure, I always let the client know and give them the opportunity to change it, regardless of deadlines or cost. For those you who do not have any design contacts, I’d be more than happy to supply you with details of some of Derby’s finest creative people. 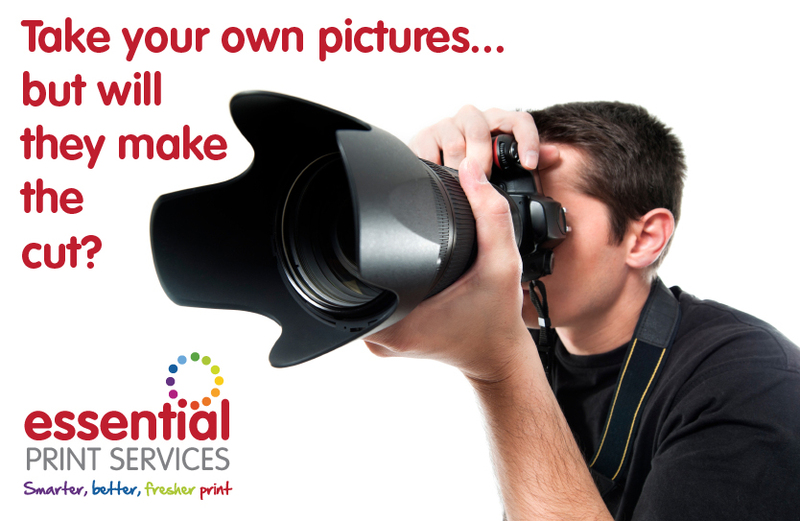 You may enjoy taking pictures of family at the weekends but are your own photography skills good enough for your company brochure? If you think they may be good enough, then email a couple of example files to your designer or print supplier. There is a lot we can do to improve lighting and focus. 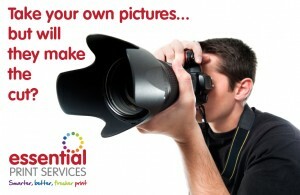 If your images are not good for the job, then it may be time to hire a professional. Choose the right professional for the job. This will save you time and money and get the best results. If you don’t know any good photographers, I know plenty. Some are better at product shots, and others may specialise at photographing people or buildings etc. If you don’t have the budget for hiring a photographer, then look at an image site called iStock.com. This site has very affordable images to purchase and download. If you’re unsure what size image you need to download, then just give me a call. If it’s your own product images you need, then of course, you won’t find them on istock.com. Perhaps you buy your products from a manufacturer who will let you use their images? If you don’t have the budget to hire a pro or simply don’t want to pay for them, why not approach them with a contra-deal – a swop of services perhaps? Avoid using images of employees. A client of mine included a picture of an old employee in their brochure without their permission and the ex-employee didn’t like it one bit. So my client reprinted them with a new photograph. If you use any images, always get permission. Whatever images you use or download – remember to back them up. Brochures represent and sell your business so they have to look and feel great. They need to make a good first impression. Any decent printer will be happy to provide anyone with a plain mockup of a brochure free of charge. If the brochure is being digitally printed, then you can request a printed mockup on the actual stock before you go to print. This way, there are no nasty surprises. If you have had brochures printed before and you change suppliers, be sure to request plain and printed samples of the material from your new supplier. One printer’s 400g board will be different to another. It may feel different, may be thicker, maybe whiter. There are hundreds of thousands of different brands of paper and board out there, so be sure you know what you’re going to order. I’m a firm believer of only using and ordering what you need. OK, it doesn’t cost that much more to get double the quantity. But if you don’t get chance to send out the extras, then they are a false economy. I’ve lost count the amount of times I’ve heard, “the last printer sold me too many brochures and now we’re moving offices so they’re just going to gather dust – can you print me some stickers to put over the address”. Just buy what you need. Don’t buy an A5 20-paged brochure if you can condense the information a little and take advantage of the cost savings that a 16-paged can provide. Simply because 16 pages at A5, is a lot more economical – you don’t use as many printing plates and you can fit more on a sheet. It’s all about saving the client money. But as an end-user you shouldn’t be expected to know that. This is the print supplier’s job – to suggest smarter ways of printing. Don’t be afraid to let your print supplier know that you’re after a really good-looking brochure, that feels like quality but doesn’t cost the earth. It is possible. They’ve just got to use their initiative and think outside the box. This is the disadvantage of using an internet based printer. There’s no one to call upon for advice. By typing in the spec you think you want, it won’t suggest a better way of doing things. Your artwork may go through an automated system and it quite often gets printed regardless of the quality or any errors. If anyone here needs advice or ideas, now or in the future, please don’t hesitate to contact me. I’d be delighted to talk to you or your contacts. What may be daunting or boring for you, is really fun and exciting for me. So make my day – and give me a call on 01332 418377. 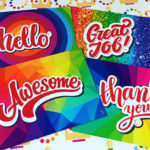 PreviousPrevious post:Essential Print Services' Owner, Yvonne Gorman, heads to Downing StreetNextNext post:Derby Hub – why local businesses need to get involved.